POD?? is recognized throughout the world as the way to get authentic amp tones and effects in a small package. Now you can take those award-winning sounds heard on countless platinum-selling albums on the road with zero hassles. amp models, 16 classic cabs, 16 modulation effects (including chorus, flanger, and tremolo), 6 delay models, and 2 different types of reverb- all with ultimate tweakability. Now, with Floor POD Plus it&rsquo;s easier than ever to create your own custom signature sound and bring it to the stage with time to spare. Spin the model knob on Floor POD?? Plus to audition 32 meticulously modeled classic and modern amplifiers. Whether you&rsquo;re looking for a mellow, glassy clean or a full-blown beast, you will find a sound to fit any style of music. 1952 Fender?? Tweed Deluxe Reverb?? With the effects in Floor POD Plus, you can create that multi-dimensional sound you&rsquo;ve always dreamed of. * All product names used in this webpage are trademarks of their respective owners, which are in no way associated or affiliated with Line 6. These trademarks of other manufacturers are used solely to identify the products of those manufacturers whose tones and sounds were studied during Line 6&rsquo;s sound model development. Whether you&rsquo;re practicing the songs you&rsquo;ve written, recording an album, or playing live on stage, Floor POD?? Plus has all the ins and outs you need to shine in any situation. Just plug in front of any guitar amp and crank it up, or plug directly into the board to instantly access that famous POD?? direct tone. MIDI In & Out - Connect Floor POD Plus to your MIDI equipment to select Channel Memories (via Program Change messages), automate settings (via Continuous Controller messages) and back up your tones (via SysEx). All the details are online at line6.com/manuals, in the downloadable MIDI Reference document. Phones - When it&rsquo;s time to monitor while recording or to make sure you aren&rsquo;t going to keep the neighbors up all night, plug in the headphones here. Output To Amp/Line - The unbalanced 1/4-inch connectors get the sound from your Floor POD Plus to a guitar amplifier, recorder, mixer or PA system. 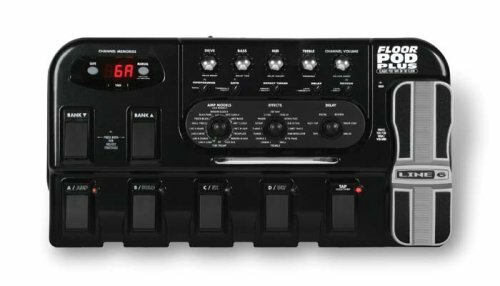 Flick the rear panel switch to AMP when you&rsquo;re feeding into the front of a guitar amp, or choose LINE to send you signal to a mixer or PA. The rear panel LEVEL knob sets the - you guessed it! &ndash; Your master output level. Changing the OUTPUT level does not change your tone, so you can get the tone you want at any volume level. Aux Input - Connect a CD player, MP3 player, drum machine, virtual accordion, or other device here, and you&rsquo;ll hear it at the Floor POD Plus headphone and Left and Right outputs. Very handy for jamming along! Input &ndash; Hey- Your guitar goes here. When you bring Floor POD?? Plus to your gig, you have all of your signature sounds ready to go with no hassles. Plug in front of any guitar amp or use the direct outs to go to the mixing board, either way you&rsquo;re gonna sound great. Why? Because they are your sounds without compromise. When it comes time to record, Floor POD?? Plus takes your signature sounds and lays them perfectly in the mix. Just plug it into the mixing board, call up your presets, and make music history. No more hauling around a bunch of heavy gear, so your broken back is a thing of the past. I could not be happier with this pedal. I had a Boss effects pedal that I could never get to sound right unless I played through an amp. I'm a Youth Pastor, and play guitar for my church twice a week, and find it difficult to get a good mix if I'm not able to plug into a direct box. A friend of mine had a Pod "bean" that I played through for Christmas and was blown away by the sound that was able to come out of that little thing. I needed to be able to switch sounds with my feet, so I went with the floor POD. It does not disappoint. I am able to get a better sound with headphones plugged straight into this pedal than I was playing through my amp with previous pedals. The only down side, and it's relatively minor. I use a BOSS tuning pedal, and although this comes with a built in tuner, the two tuners do not agree (try saying that 5 times fast). If I tune with my BOSS pedal, the POD shows me being sharp. The BOSS has always been consistant, so I will continue to use it. Also, if tuning with the POD pedal, the sound does not automatically shut off, instead it kills all of the effects but continues to play through the PA.